Are you mystified by mastering ? Just started - get involved now ! Have you watched all the videos, read all the blog posts, tried all the plugins – but when it comes to mastering in your own studio, you just can’t seem to fit all the pieces together? Is mastering a mystery to you? Well, I know how you feel – and I felt exactly the same, when I was starting out ! My name is Ian Shepherd – I’m a mastering engineer and producer, and the founder of Dynamic Range Day. I’ve been mastering for over twenty years now, but when I started I didn’t even know what mastering was ! What helped me most when I was just starting out working as a tape-op was sitting in on real mastering sessions with my colleagues, and getting an “insider’s view” of how they worked – of what they did, how they did it, and why. The chance to be a “fly on the wall” gave me invaluable insights into the mastering process as a whole – what you’re trying to achieve, the different ways to do it, and how everything fits together into a simple process, taking you from raw mix to the final master. And I know lots of you would like the same opportunity – every week I get emails asking if someone can work as an intern with me, or sit in on a few sessions – or just ask general questions about the way that I work. There just isn’t enough time to address everyone’s questions individually, though – and that’s why I came up with the Home Mastering Masterclass. I look forward all week to receiving your tutorials. This is the best online experience I've ever had... thank you so much for doing this.... my music is sounding MUCH better….. Introductory "Getting Started" video: "Home Mastering Essentials"
Email your questions to a dedicated address - ask me anything ! I'll answer as many of the popular and interesting questions as I can. Tell me what youwant to know ! Just to tell you how much you influenced my work: a year ago I started the project to make an album all by myself. In April I had 3 tracks finished and went to Abbey Road to master them. You changed the way I enjoy and do music, for the best I believe, but now I am 2 months behind my schedule! Thank god it is not my job, just an expensive hobby :) Thanks for the help and the great advices. Sign up today, and you get the Home Mastering Essentials video plus additional introductory content to download right away. Watch the videos, try some of the ideas yourself and then email me with any questions you have or requests for more detail. I’ll answer as many as possibly in the Q&A webinars. There will be a new Masterclass video and interview to download every week from then on, covering more and more advanced mastering techniques. Finally you’ll get the concluding Home Mastering Overview video, which pulls everything together and adds more detail to several topics. Week 1: Home Mastering Essentials Video & "Obvious" by the Freefall Music Co. Your approach has definitely poured light on many aspects for me and it actually grants this unique feeling of confidence which was not there before. I've missed the start of the course, will I be able to catch up? Will the videos apply to the kind of music I want to master? Do I need specific software or plugins to get the best out of the course? No. The methods and techniques in the course can be used with any decent digital audio workstation, and most quality plugins. The videos use a wide range of popular packages including Logic, Pro Tools, Wavelab and Reaper, so there's a good chance one of them will use software you're familiar with. Is the course 'Live' ? Do I need to be present at particular times to take part ? No. You can download and watch the videos whenever you like. I just release them weekly to avoid "overwhelm". 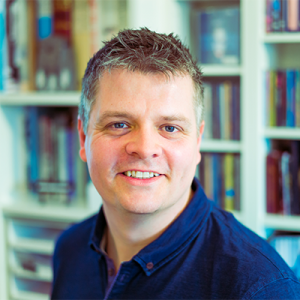 There is one "time-sensitive" element - I record new Q&A podcasts while the course is running in response to people's questions - this is how I personalise the course to make sure everyone gets what they need out of it. It doesn't matter when you ask the question - asking something about Week 1's content during Week 7 is fine, for example - but I can't guarantee to answer questions once the course has ended, so if you do have a question it's best to ask it while the course is running. There's also the most activity in the Facebook group while a course is running and lots of people enjoy this "community" aspect of the course, talking to other people doing it at the same time. Otherwise it's up to you - you're free to use any of the materials in whatever way works best for you. Whenever I work on a real mastering session, I always take some time to talk to the client, to find out more about their music - how it was recorded, how they would like it to sound, and whether they have anything particular they hope to achieve with the mastering. I've done the same for these videos, via Skype, and recorded the conversations so you can eavesdrop on this part of the process, too. I'd originally intended these interviews to be an optional bonus, but what surprised me was that the results are far more valuable than I ever expected ! Between all the songs we covered a huge range of topics, so there's a mass of helpful information there about writing, recording and mixing as well as mastering - so, I'm bundling them in with the videos and I strongly recommend you listen to them as well as watching the videos, to get maximum value out of the package. If you'd like to get the maximum possible benefit from the course, you may like to choose the "Enhanced" package for a further huge discount on two fantastic additional resources - the "Home Mastering EQ" video pack (worth £67) and the brand new "Home Mastering Compression (and limiting)" video series (worth £87) including the acclaimed eBook "Mastering with Multiband Compression". 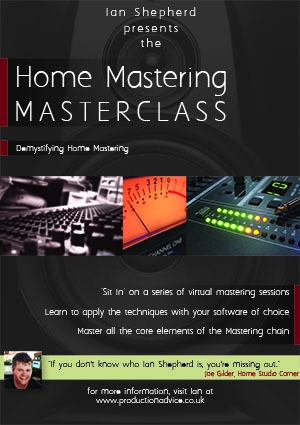 Together these courses add even more depth and detail on these fundamental home mastering topics. Get started now - immediate access ! I've had such a great reaction to the videos from everyone who has seen them, I'm certain you'll find them useful too. I want you to be completely happy though, so if you're not satisfied for any reason, just contact me within 90 days for a full refund, no questions asked - and the videos are yours to keep. One concern I had was I did think it was a bit pricey...... just being honest..... it's actually why I didn't grab it right away, and then I figured, what the heck, go for it, and I am happy I bought it. I really enjoyed it and here's why. It was simple, easy to understand and made sense to someone like me. A lot of stuff out there is way too detailed and confusing, you just got right to the point and made sense..... that's a skill my friend. I find when I read some stuff, I learn a lot but am left more confused than when I started.... I have more questions about what I learned than answers, ya know..... but not after your book..... and the video was a great way to see it in action. The learning curve is huge!!!! But I think I'm getting somewhere lately, and you have really helped. P.S. People have been asking me for a product like this for years, but I wanted to wait until I had the time to do it properly. I'm really proud of the final result, and I know you'll get a massive amount of value from the videos, interviews and Q&As. To get started, click here!